Everyone on planet Earth know at least one or two of Seth MacFarlane's many incredible voices. You might recognize his work from one of his many hit movies or TV shows, or perhaps you know what he looks like from watching one of the various awards shows he has hosted over the years. Seth MacFarlane is the man who brought us Family Guy, American Dad, The Cleveland Show, Ted, and A Million Ways to Die in the West, and we've put together a list of inside secrets about his hilarious world. Who is Seth MacFarlane when he's not working on one of his various projects? When did he get into animation? Why does he love doing it? What are his long term goals? What's his relation to the science world? What are some of his other (many) talents? How much is he worth? What is his personal life like? We've poured through Seth MacFarlane's bios, stories, trivia facts, quotes, and anecdotes to make this MacFarlane fun fact list. If you want to know more about this hilarious animator, voice-actor, producer, and writer, vote up the best fun facts on this list below, and be sure to let us know what you think in the comment section. 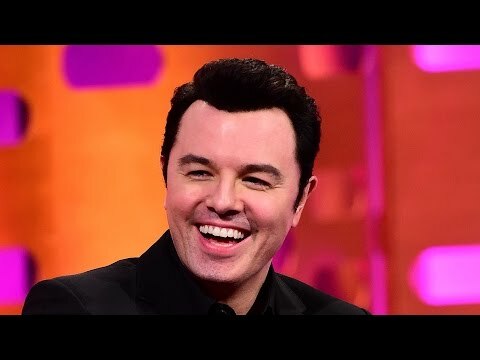 Any fan of Family Guy knows that Seth MacFarlane loves singing, but many people don't know that he's actually quite a talented singer. He's released a number of albums, and has even won a Grammy. MacFarlane has worked with some of the best vocal coaches in the industry to hone his singing talent. "Often I'll record one voice first, leaving pauses for the other character's lines. I'll then play back the first character in my headphones while voicing the second character, so it feels like I'm playing opposite another actor." Seth MacFarlane was doing a lot on the set of Ted. Not only was he the writer, the director, and the voice of Ted, he was also the physical body of Ted! He was hooked up to sensors that the CGI team used to match Ted's body movements in the film. It must have been so fun to have the voice of Ted acting out the scenes side by side with the other actors. There was a terrifying incident when Seth was a baby that gave him that scar on his head, and left his mother horribly injured.